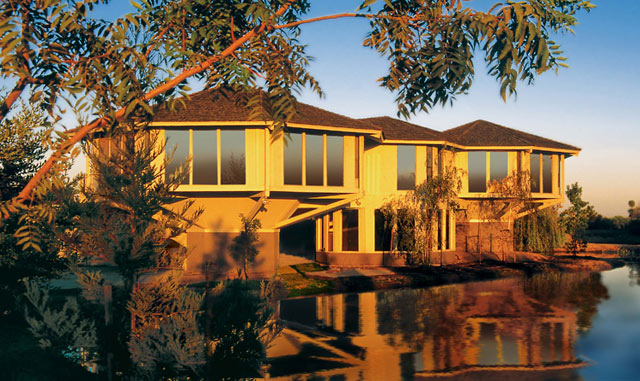 Premiere house plans are large luxury homes with elegant design features, showcasing our versatile building system. Various foundations, finishes and accoutrements. Sizes from 3,000 sq. ft. to 9,000 sq. 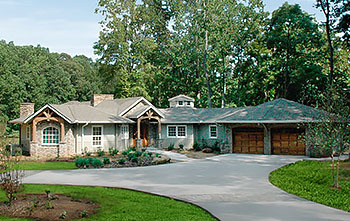 ft.
Classic house plans are ideal, efficiently designed, primary homes, vacation homes or retirement homes. Buildable on the most demanding terrain or site. Sizes from 1,300 sq. ft. to 3,000 sq. ft.
Signature Design Collection house plans are a blend of craftsman style architecture and Topsider's unique multi-sided Post & Beam building system, each custom designed to client preferences. 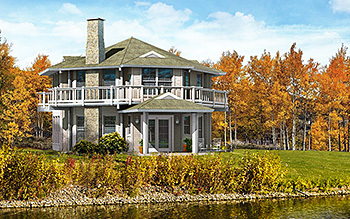 Two-story house plans range from small and efficient homes to large and luxurious. Each may be built over a basement, slab-on-grade, crawl-space or on pilings. Sizes from 1,075 sq. ft. to 2,620 sq. 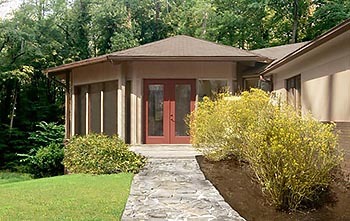 ft.
Patio house plans range from small one-bedroom cottages, to three-bedroom, leisure living plans. 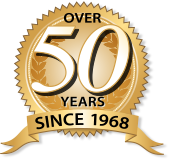 Buildable on conventional foundations, basements, pilings or pedestals. Sizes from 475 sq. ft. to 1,550 sq. ft.
Pilings (also referred to as stilts or piers) may be the perfect solution for building near the coast and in flood plains. Their flexibility in height also makes them ideal for uneven terrain or where elevation is desired for view. 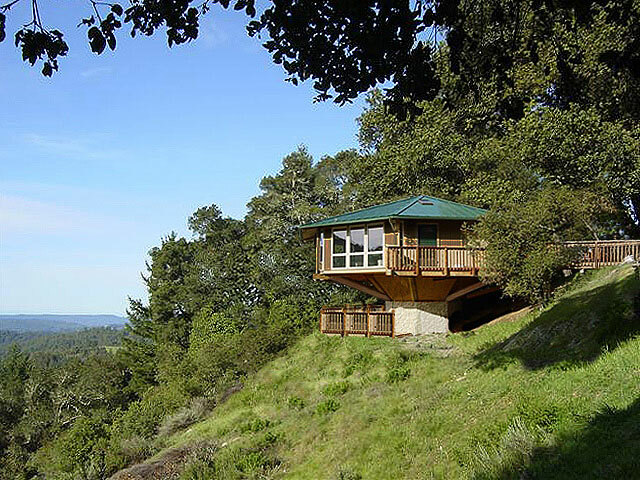 Two-story piling (or stilt) house plans are ideal for small building lots and where higher elevation provides great views. 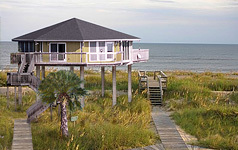 Topsider's Post & Beam structure makes them hurricane proof for coastal and beach locations. 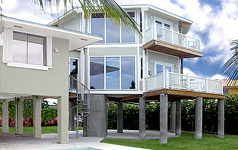 Pedestal house plans are Topsider Homes signature design. This unique foundation allows efficiently built homes on the most difficult lots. Sizes from 575 sq. ft. to 1,650 sq. ft. (for single units). Enclosed Pedestal house plans are a variation to our basic pedestal design, efficiently enclosing the areas around the pedestal for added livability or simply an entryway. Sizes from 850 sq. ft. to 2,000 sq. ft.
Family and recreational room additions, master bedroom suites, and home office additions are ideal for Topsider's flexible building system, and can be designed to meet nearly any need, budget or building site. 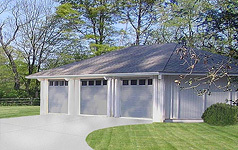 Topsider Garages include both attached and detached 2, 3 and 4 car garages, apartment garages, and multi-purpose garages with workshops, offices, rec rooms, home gyms, studios and more. Sizes from 600 sq. 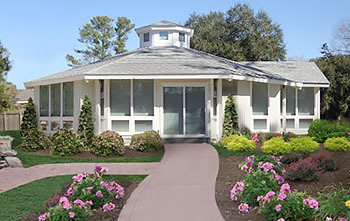 ft.
Topsider's small house plans are ideal guest houses, in-law & granny flat additions, pool house designs and studios. 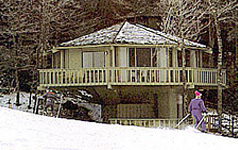 Each is customized to blend with existing architecture and can be built on any foundation type. 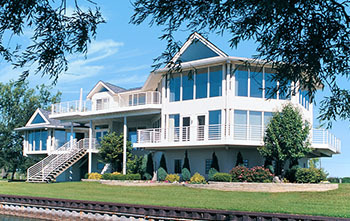 Topsider Homes has designed restaurants, nursing homes, convenience stores and more. The flexibility and efficiency of our building system makes it ideal for light commercial development.